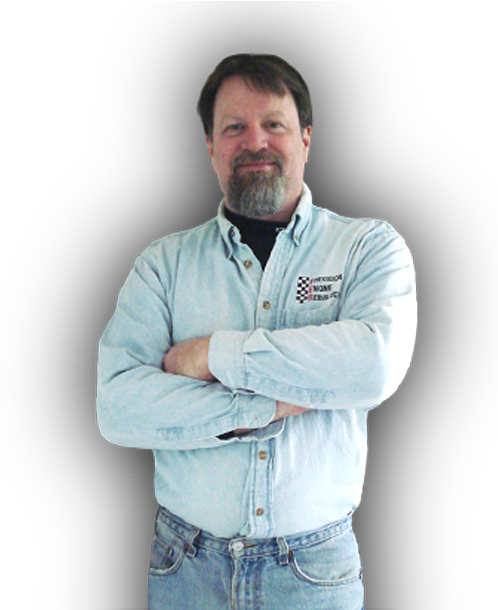 PER founder and head machinist Randy Crowley answers your tech questions. The top questions will be posted here along with Randy’s answers. What types of motors does PER work with? PER works with road race, drag race, oval race, dirt track, street rods, restoration, Motorcycles, 2 cycle, 4 cycle, recreation vehicles such as snow mobiles and jet skis, marine and light industrial. Do you do power adders? We do motors for normally aspirated, nitrous, turbo chargers, and super chargers. We are proud to be a Procharger distributor. Are you just a Ford guy? No, we do all domestic and most import motors. What would be the turnaround time? For cylinder heads, usually 1-3 days depending on what repairs need to be completed. We do complete repairs on aluminum cylinder heads including welding and porting. Additional time is required for porting. For complete motors, generally 3 weeks depending on availability of parts. What is the story behind the PER Mustang? The PER Mustang was built to be competitive. We purchased the body in white and built the car from the ground up (we have pictures of all the steps). The car was completed and introduced into the NMRA Renegade class in 2005 with a nitrous modular 5.4 motor. From 2005-2007, the car was run in this class. We changed the motor into a pushrod motor 400 CI with nitrous. In 2007, we placed 4th in the nation. We won the race in Atco, NJ and were runner up here at Joliet, IL. Since then, the car has been out in the IMSM racing series here in the Midwest.